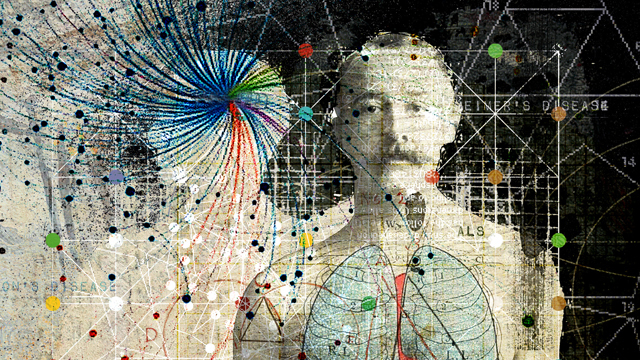 The quest for immortality has inspired humankind since the dawn of civilization. Diverse ancient myths and religious stories tell of miracle drinks that bestowed eternal life on the gods, while kings across the ages have quested for comparable real-life elixirs. Chinese emperors, drawn by the promise of eternal life, swallowed concoctions containing everything from gold to arsenic and mercury, an often lethal cocktail. More recently, the late North Korean dictator Kim Il-Sung purportedly received transfusions of blood from young donors in hopes of extending his life. All these failed attempts at achieving longevity underscore the harsh truth that death will, inevitably, overtake us. Nevertheless, a century of research has brought us closer than ever to understanding what causes aging and what might be done to postpone its ultimate outcome. Restricting the caloric intake of rats increases their life span by up to 50 percent, an observation that has been repro­duced in organisms as distantly related as yeast, Drosophila, and Caenorhabditis ele­gans. Clearly, caloric restriction is not universally beneficial. But by studying the influence of diet on aging in the brain, researchers have discovered a number of bioenergetic molecules and druggable targets that may serve as candidates for interventions to delay the onset of neurodegenerative disorders. Thus, while immortality remains a fantasy, living a longer healthy life may be an achievable goal. Of the many benefits of caloric restriction, improved ability to maintain glucose homeostasis is probably the best established. Caloric restriction improves glucose tolerance, decreases insulin secretion from the pancreas, and increases insulin sensitivity in the peripheral tissues in model organisms as well as in humans. Not surprisingly, mice and humans on caloric restriction are also leaner, with reduced fat accumulation in the liver, resulting in a decreased risk of developing fatty liver disease. Markers of inflammation also decrease, and cardiovascular parameters such as blood pressure improve—effects that can also be explained by improved insulin signaling and glucose homeostasis. In addition, calorie-restricted animals are smaller than their well-fed counterparts, perhaps corresponding to decreased cell proliferation, a phenomenon that occurs in response to energy deficits in both normal and cancer cells. Decreased cell proliferation may be important, since a cell can only undergo a finite number of divisions before it ceases to divide, a phenomenon called cellular senescence. In simple organisms such as yeast, two types of life span can be defined: a chronological life span, or the length of time a yeast cell can survive, and a replicative life span, or the number of cell divisions a yeast cell can undergo. Limited replicative potential is also observed in mammalian cells, where it is referred to as the Hayflick limit. (See “Of Cells and Limits.”) Decreased cell proliferation also leads to slower division of stem cells, allowing these progenitor cell populations to supply the various cell types of the body for longer periods of time. This sparing of stem-cell pools could explain why dietary restriction is particularly effective in maintaining tissue homeostasis in rapidly proliferating tissues such as skin, hair, and bone marrow. Neural tissues, such as the brain and spinal cord, have a limited capacity to rejuvenate themselves through stem-cell renewal, however, perhaps explaining why dietary restriction may not impact these areas of the body as much as others. To complicate matters, rodents and many other model organisms do not normally suffer from neurodegeneration, and a possible neuroprotective effect of caloric restriction therefore cannot be extrapolated from longevity studies interrogating dietary interventions in those models. In order to circumvent this problem, researchers are studying neurodegenerative and premature aging diseases in humans to understand the effect of diet on brain health and aging. BRAIN DRAIN: The brain has a remarkably high metabolism, consuming some 20 percent of the total body energy under resting conditions. Largely unable to metabolize fatty acids for energy, the brain depends on glucose and secondary metabolites synthesized from fatty acids called ketones. Studies of several neurological disorders, which tend to be associated with increased basal metabolism, suggest that disease progression can be influenced by switching the energy source from glucose to ketones. See full infographic: JPG | PDF© DUNG HOANGUniversity of California, Los Angeles, researcher Roy Walford, a pioneer in the field of caloric restriction, felt so strongly about the benefits of this dietary intervention that he even practiced a version of it himself, convinced that it would allow him to live to age 120. Nevertheless, he was diagnosed with amyotrophic lateral sclerosis (ALS), a rapidly progressing neurodegenerative disorder, and died in 2004 at age 79. It is now relatively well established that caloric restriction exacerbates the progression of ALS, while increasing caloric intake attenuates the disease. This may reflect an increase in basal energy consumption in ALS patients.2 Indeed, a recent study suggests that ALS patients can ingest a high-calorie diet without developing diseases such as obesity and diabetes.3 Unfortunately, the increased catabolism, in combination with progressive feeding difficulties, leads to significant weight loss in ALS patients. These observations suggest that caloric intake can profoundly alter neurological health, supporting the idea that the human brain may be particularly sensitive to alterations in energy homeostasis. 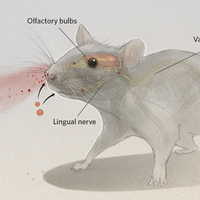 This sensitivity may stem from the organ’s remarkably high metabolism: under resting conditions, the brain consumes roughly 20 percent of total body energy production, despite constituting only a minute fraction of body weight. In addition, the brain does not store energy as glycogen or fats as other organs do. In fact, the nervous system is largely unable to metabolize fatty acids for energy. Thus, the brain is highly dependent on glucose as a fuel source. Likely due to this strong glucose requirement for normal brain function, the majority of glucose uptake in the brain is insulin independent. Insulin increases brain glucose uptake by 10 to 20 percent, however, and central insulin resistance, which may occur in type-2 diabetes, decreases this insulin-stimulated glucose uptake. Age-associated disorders such as Alzheimer’s, Parkinson’s, Huntington’s, and ALS appear to be influ­enced by dietary energetic intake. As an alternative to glucose, the brain can draw energy from ketones, a group of metabolites synthesized from fatty acids in the liver. Interestingly, the addition of ketones as an alternative fuel source for the brain attenuates the progression of Alzheimer’s in a mouse model of the disease.4 In contrast, fatty-acid ingestion is associated with the development of the disease, though likely only in carriers of the APOE4 risk allele. The mechanism for this is not well understood but may involve the role of APOE4 in the transport of cholesterol in the blood. Increased ingestion of fat leads to increases in circulating cholesterol levels that may predispose individuals with APOE4 to atherosclerosis, which in the brain vasculature is an independent risk factor for the development of Alzheimer’s. Notably, diabetes, which leads to widespread atherosclerosis, is also an Alzheimer’s risk factor. It is clear that certain age-associated disorders such as Alzheimer’s, Parkinson’s, Huntington’s, and ALS appear to be influenced by dietary energy intake.8 (See illustration.) Nevertheless, little is known about how normal brain aging is modulated by dietary changes. Because many model systems, including rodents, do not naturally develop neurodegeneration, this has been a particularly challenging problem to address. DNA DAMAGE IN AGING CELLS: A high-fat diet, and in particular a ketogenic diet, can rescue symptoms in animal models of Cockayne syndrome, an accelerated aging disorder caused by defects in DNA repair, suggesting that genome instability introduces metabolic alterations that occur in the aging process. Accumulation of damaged DNA leads to activation of poly-ADP-ribose polymerase 1 (PARP1). 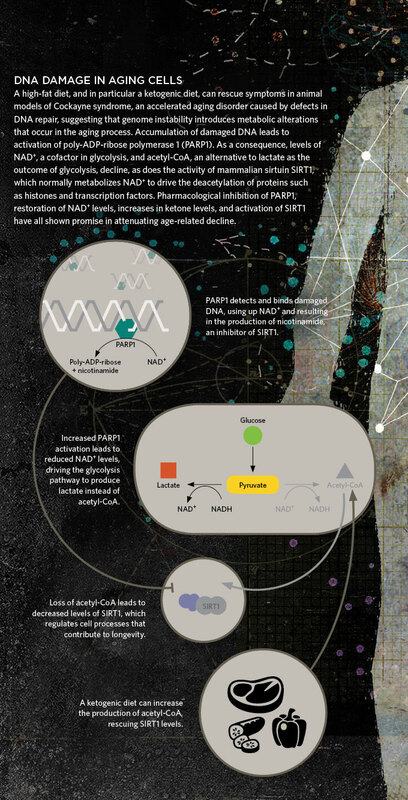 As a consequence, levels of NAD+, a cofactor in glycolysis, and acetyl-CoA, an alternative to lactate as the outcome of glycolysis, decline, as does the activity of mammalian sirtuin SIRT1, which normally metabolizes NAD+ to drive the deacetylation of proteins such as histones and transcription factors. Pharmacological inhibition of PARP1, restoration of NAD+ levels, increases in ketone levels, and activation of SIRT1 have all shown promise in attenuating age-related decline. 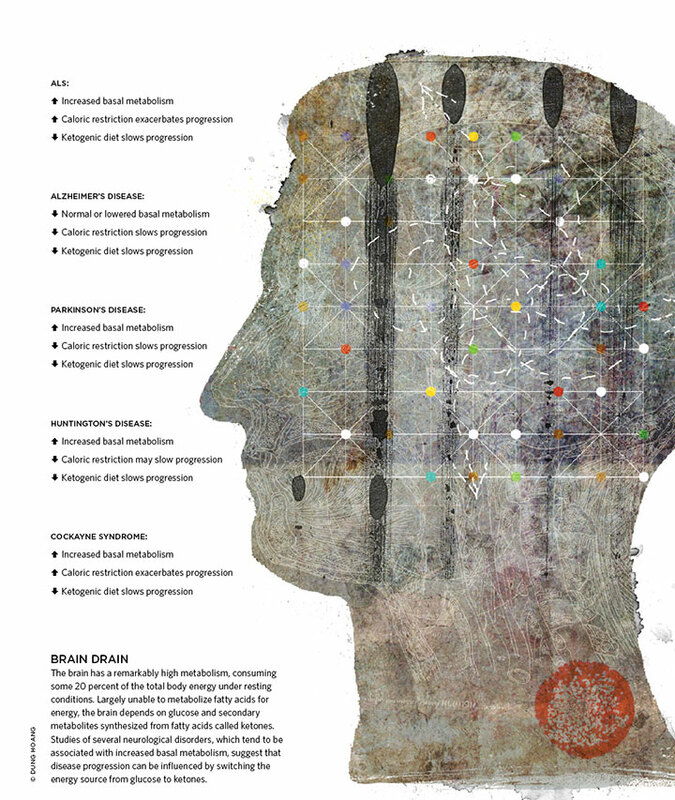 See full infographic: JPG | PDF© DUNG HOANGAnother window into normal brain aging could be disorders characterized by premature age-related changes in the brain. Cockayne syndrome patients, for example, develop very severe neurodegeneration—in addition to a host of other premature aging symptoms and extreme weight loss—and usually die by their teenage years.9 The disease is exceedingly rare and is, in most cases, caused by mutations in the CSA or CSB genes, which encode two proteins involved in DNA repair. CSA and CSB proteins may also be involved in the control of transcription and in remodeling proteins that bind and package DNA, such as histones. Still, there is no good mechanistic explanation for the pathogenesis of this disease. One intriguing aspect of Cockayne syndrome is how similar its clinical presentation is to known primary mitochondrial disorder symptoms, including progressive atrophy of the brain, lactate accumulation, hearing loss, and seizures. Since mitochondrial dysfunction has long been suspected to be a hallmark of the aging process, a defect in this crucial organelle’s function could explain the accelerated aging features in Cockayne syndrome. Indeed, mitochondrial dysfunction has been observed in cells from Cockayne patients as well as in mice that harbor a truncation mutation in the murine homologue of human CSB. Like Cockayne syndrome patients, these mice show increased basal metabolism and loss of fat deposits. 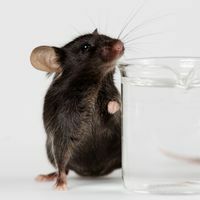 Feeding these animals a high-fat diet, however, rescues them from the disease phenotype, while caloric restriction exacerbates features of accelerated aging. Because the mammalian brain does not metabolize fatty acids, a secondary metabolite, such as ketones, could be responsible for the beneficial effect of the high-fat diet. Indeed, ketones increase the life span of a short-lived nematode model of Cockayne syndrome. Ketones also ameliorate mitochondrial changes in models of Cockayne syndrome and have recently been shown to have life span-extending properties in wild-type C. elegans. Interestingly, ketogenesis, the production of ketones as a result of fatty acid breakdown, can be induced by fasting, suggesting that ketones could play a central role in the increased longevity effects of caloric restriction observed in the lab. Fasting, however, also leads to a decrease in blood glucose levels, perhaps leading to brain energy shortage in diseases such as Cockayne syndrome, where energy demand is increased. The observation that ketones may slow aging caused by defects in DNA repair also suggests a link between genome instability and metabolic alterations. Levels of lactate, formed from pyruvate during glycolysis, are increased in the brain of Cockayne syndrome patients as well as in aged individuals. One factor influencing these levels is the ratio of NAD+ to NADH, cofactors in the conversion of pyruvate to lactate. 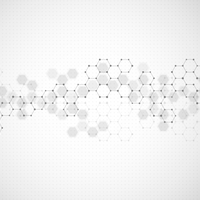 NAD+ is a particularly interesting compound in the context of DNA repair. 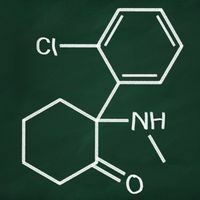 In the process of DNA-damage signaling, this molecule is consumed by the enzyme poly-ADP-ribose polymerase 1 (PARP1), which has previously been shown to be increasingly activated with age. Indeed, PARP1 is hyperactivated in several accelerated aging disorders thought to be caused by defects in DNA repair and concomitant accumulation of DNA damage. Greater PARP1 activity uses up more NAD+, leading to a decrease in the NAD+/NADH ratio and increased shunting of glucose to lactate. This also results in decreased production of acetyl-CoA, an alternative outcome of glycolysis and the fuel source for the mitochondrial citric acid cycle. (See illustration.) But cells can also get acetyl-CoA by metabolizing ketones and fatty acids, and it is likely that the beneficial effects of a high-fat diet in Cockayne syndrome mouse models can be attributed to the normalization of acetyl-CoA levels. Recent data suggest that the life-extending effects of ketones and NAD+ both converge on the activation of SIRT1.1 The role of SIRT1 in these processes may be of particular interest given that SIRT1 is highly expressed in the brain and represents a druggable target with multiple specific pharmacological activators currently being developed.12 Indeed, several of these activators appear to be able to extend the life span of rodents. The efficacy of these compounds in ameliorating brain aging will be a particularly exciting aspect to investigate in future studies. 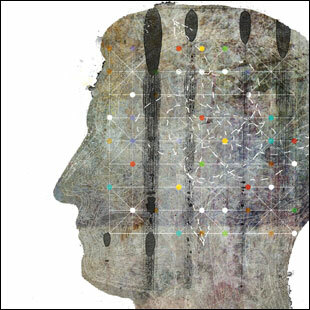 Although a wealth of knowledge regarding interventions in specific age-associated diseases such as Alzheimer’s and Parkinson’s diseases have been reported, little is known about interventions that may modulate normal brain aging. We are, however, getting closer to an understanding of fundamental aspects of neurological aging, and we may soon be able to intervene in the aging process as a whole, perhaps with the benefit of preventing Alzheimer’s, Parkinson’s, and other age-associated neurological diseases. Increasing the level of circulating ketones, through dietary interventions or exogenous ketone sources, may be one relatively easy way to intervene, and could be efficacious either alone or in combination with other targeted interventions. Further studies are needed to understand the optimal dietary regimens and supplements, but there are grounds for optimism. Morten Scheibye-Knudsen is a research fellow at the National Institute on Aging. His research has focused on brain aging and how various interventions might attenuate age-related neurological decline. 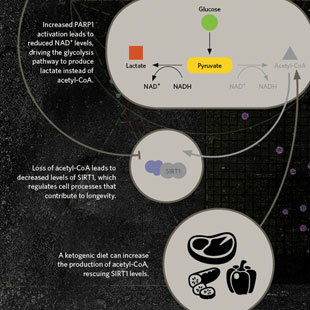 M. Scheibye-Knudsen et al., “A high-fat diet and NAD(+) activate Sirt1 to rescue premature aging in Cockayne syndrome,” Cell Metab, 20:840-55, 2014. L. Dupuis et al., “Energy metabolism in amyotrophic lateral sclerosis,” Lancet Neurol, 10:75-82, 2011. A.-M. Wills et al., “Hypercaloric enteral nutrition in patients with amyotrophic lateral sclerosis: a randomised, double-blind, placebo-controlled phase 2 trial,” Lancet, 383:2065-72, 2014. Y. Kashiwaya et al., “A ketone ester diet exhibits anxiolytic and cognition-sparing properties, and lessens amyloid and tau pathologies in a mouse model of Alzheimer’s disease,” Neurobiol Aging, 34:1530-39, 2013. D.N. Ruskin et al., “A ketogenic diet delays weight loss and does not impair working memory or motor function in the R6/2 1J mouse model of Huntington’s disease,” Physiol Behav, 103:501-07, 2011. Z. Zhao et al., “A ketogenic diet as a potential novel therapeutic intervention in amyotrophic lateral sclerosis,” BMC Neurosci: 7:29, 2006. T.B. VanItallie et al., “Treatment of Parkinson disease with diet-induced hyperketonemia: a feasibility study,” Neurology, 64:728-30, 2005. V.D. Longo, M.P. Mattson, “Fasting: molecular mechanisms and clinical applications,” Cell Metab, 19:181-92, 2014. M.A. Nance, S.A. Berry, “Cockayne syndrome: review of 140 cases,” Am J Med Genet, 42:68-84, 1992. S. Imai, L. Guarente, “NAD+ and sirtuins in aging and disease,” Trends Cell Biol, 24, 464-71, 2014. A.P. Gomes et al., “Declining NAD(+) induces a pseudohypoxic state disrupting nuclear-mitochondrial communication during aging,” Cell, 155:1624-38, 2013. D.A. Sinclair, L. Guarente, “Small-molecule allosteric activators of sirtuins,” Annu Rev Pharmacol Toxicol, 54:363-80, 2014. Clarification: An editorial change to this story may have given the incorrect impression that Morten Scheibye-Knudsen headed the lab whose work was described. He was actually research associate at that time. The Scientist regrets any misunderstanding.